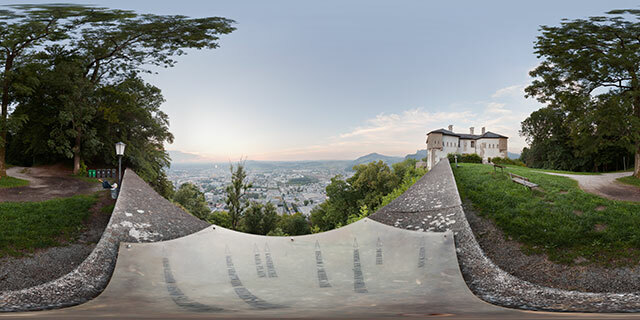 360° VR panorama of inside the Gertraudenkapelle (Gertraude chapel) of the Petersfriedhof catacombs, in Salzburg, Austria. St. Peter’s Cemetery is the oldest Christian burial place in Salzburg. The catacombs are hewn into the cliff face of Mönchsberg, which overlooks the cemetery and Church. They are the oldest visible part of the graveyard, and may date from as early as the 5th century. The cemetery, along with the adjacent St. Peter’s Abbey, were founded around 700 AD. 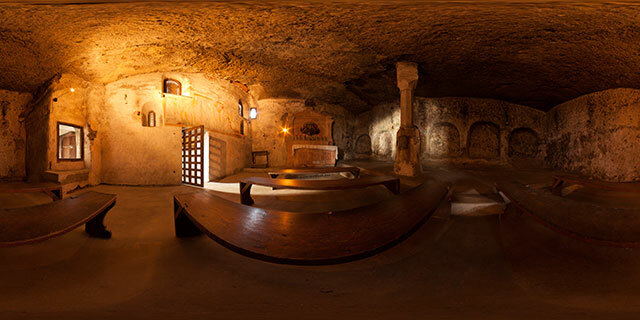 The Gertraudenkapelle was likely originally a cave, that was then expanded by hand to form the chapel. The chapel was consecrated in 1178 by Conrad of Wittelsbach, Archbishop of Salzburg. It is dedicated to St. Thomas Becket (Archbishop of Canterbury), who was assassinated in 1170. Gertraude chapel is also dedicated to Saint Gertrude of Nivelles and Saint Patrick of Ireland. On the hill side of the chapel there are six arched niches cut into the rock, dating from 1865. These served as seats for priests during the liturgy. A Romaneque Gothic pillar is situated near the centre of the chapel, this was installed in the 17th century. At the front of the chapel is a clay plate altar. This was constructed in 1862, and is modelled after the pattern of pre-Christian altars found in the catacombs of Rome. The altar features a baroque picture of the saints to whom the chapel is dedicated. At the front of the lower part of the altar are three contoured clay plates. These depict an anchor, cross, and hanging lamp (fire), which represents the divine virtues of hope, faith, and love. The entrance to Gertraudenkapelle is on the side that looks towards St. Peters Church. Above the door is a fresco depicting the Martyrdom of St. Thomas Becket. 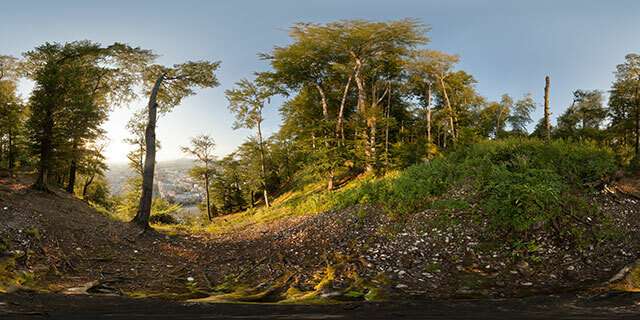 360° VR panorama from part-way up the north-western side of Kapuzinerberg, in Salzburg, Austria. Kapuzinerberg is a large hill located in the Altstadt (Old town) district, near the centre of Salzburg. The view in this panorama is looking out north over the Neustadt (New town) district. Kapuzinerberg is a wooded hill, and features various rare alpine plants. Chamois (similar to goats) also live on the hill, though are very difficult to see.